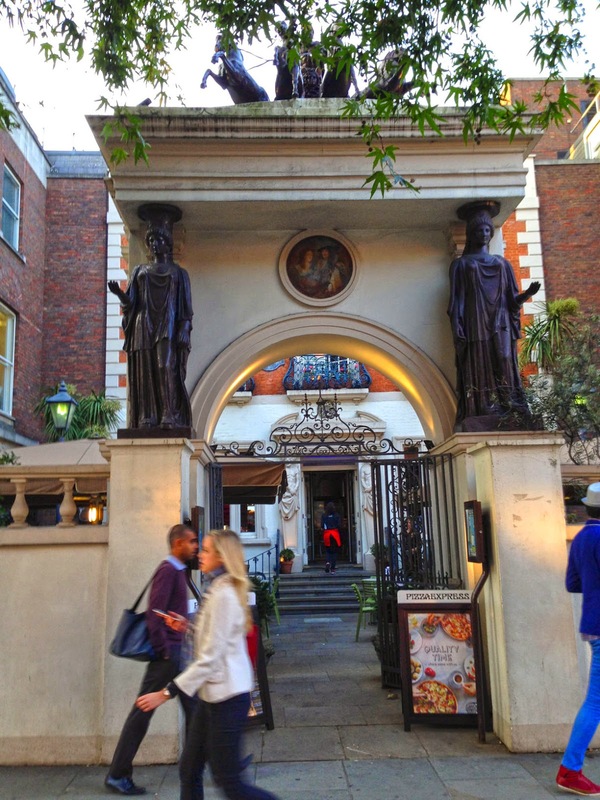 So, if you'd like to discover this bit of urban English paradise, then come with me on this run through another fascinating London neighborhood. We'll start the run at Sloane Square, easily reachable with the Circle- and District- tube lines. Sloane Square was known in the 1980s for the Sloane Rangers, a kind of London version of the Valley Girls: yuppie women known for dedicating their lives to the two lofty goals of shopping and partying (while drinking plenty of Pimm's, and hanging out in very traditional settings). Step out of the tube the station, and face westwards, along the south side of the square. 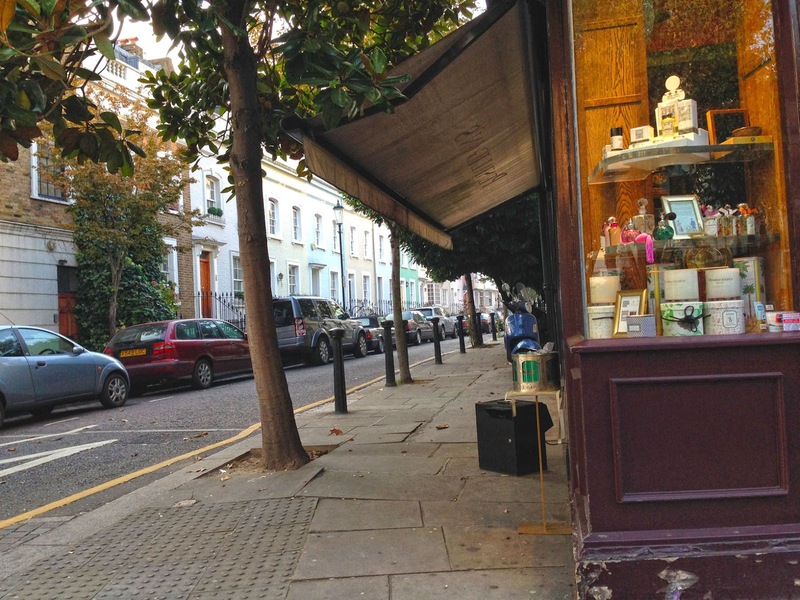 Take off running and you'll be on Kings Road, one of London's most famous shopping streets. I normally try to avoid running on streets with lots of shoppers, but this one is definitely worth the people-watching, and is an important part of the neighborhood. But try to avoid it during peak hours. You'll soon pass the Duke of York Square on the left, until recently the Georgian-styled site of a military school. Now the buildings have been redeveloped into elegant housing, the Saatchi art gallery and a shopping mall (what else would fit around here?). On both sides of the street, you'll see nice side-streets with their little private parks creating green squares down the middle of the street. Kings Road is very posh today: full of rich foreigners out looking for expensive stuff. But, ironically, it became famous in the 1970s as the birthplace of punk fashion. You won't find any punks around here any more. Probably, the last punk to walk through here was snatched off the street and stuffed, to then be put into a Madame Tussaud's exhibit, forever frozen with his middle finger extended defiantly against the flood of yuppie invaders. When you reach Jubilee Place, turn right to make a zig-zag through one of my favorite parts of the neighborhood. 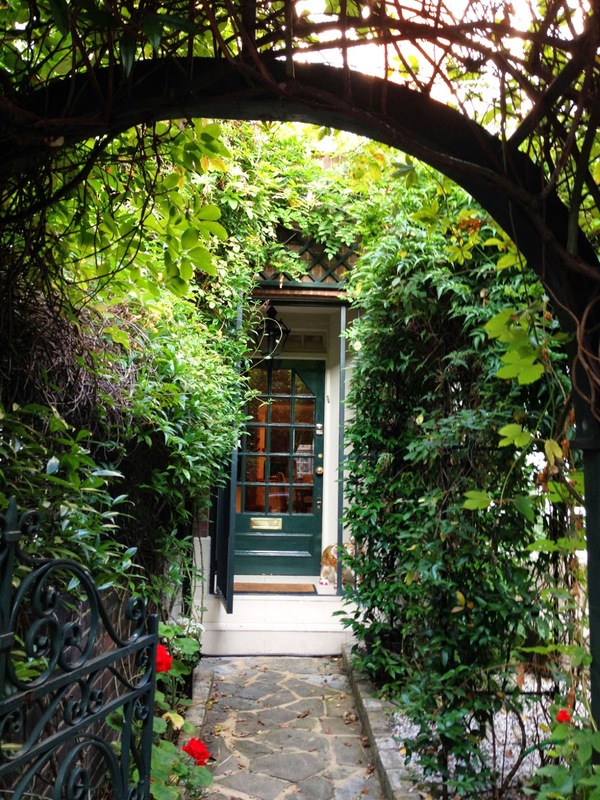 The houses around here are what I really like about Chelsea: low -- just two floors -- with a bit of garden out front and enough friendly details in the facades to make them homey and appealing. 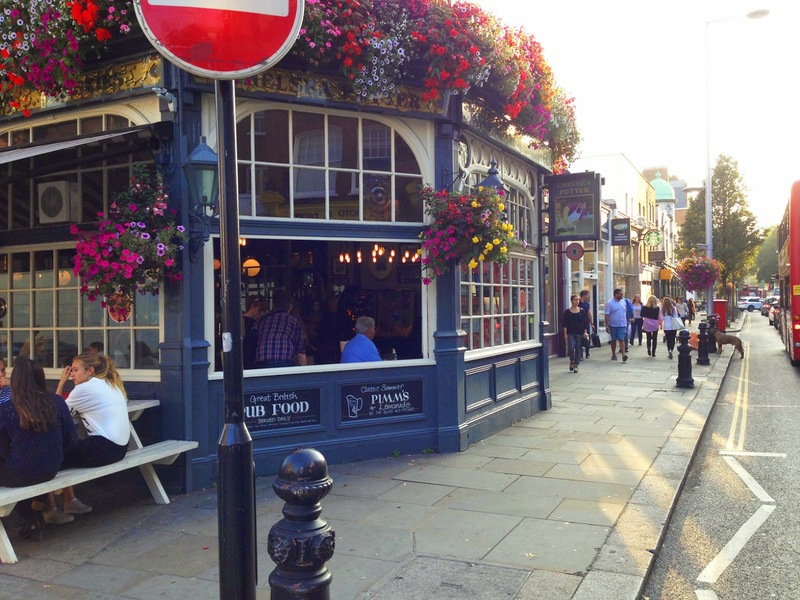 At the end of the block, turn left at the tiny triangular square and its friendly pub. 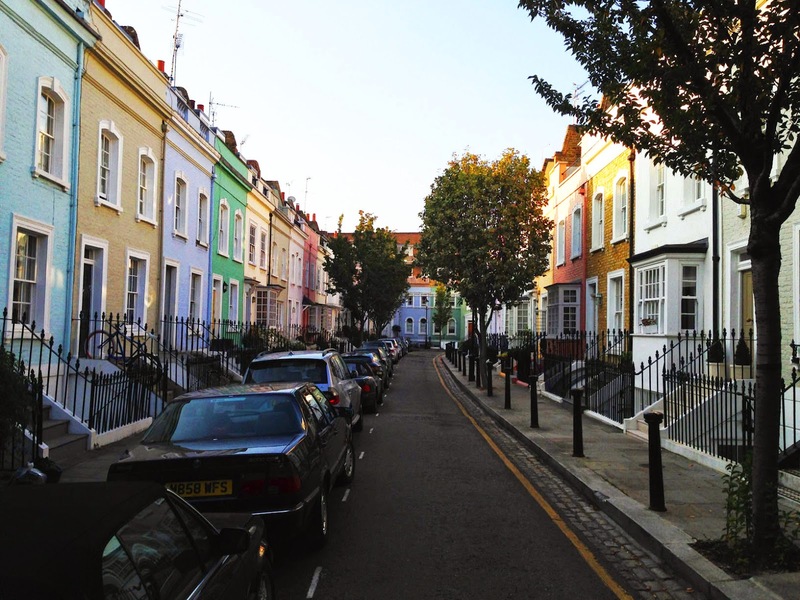 Run a few more blocks to then turn left again on Astell Street, one of several around here with very colorful houses. Now follow it southwards, back to Kings Road. At Kings Road again, cross the street and turn right to run to Flood Street in just a hundred meters. Turn left onto Flood to continue running southwards. You'll pass St. Loo's Church, and then Flood runs into Royal Hospital Road just as it hits the Thames River, lined by the riverside road, the Chelsea Embankment. NOTE: a great little park, the Physic Garden, originally created to grow medicinal plants for apothecaries, is just a block to the left. And just a block further east, on the grounds of the Royal Chelsea Hospital is the spot for the yearly Chelsea Garden Show: a Mecca for anyone interested in brushing up against gardening genius. 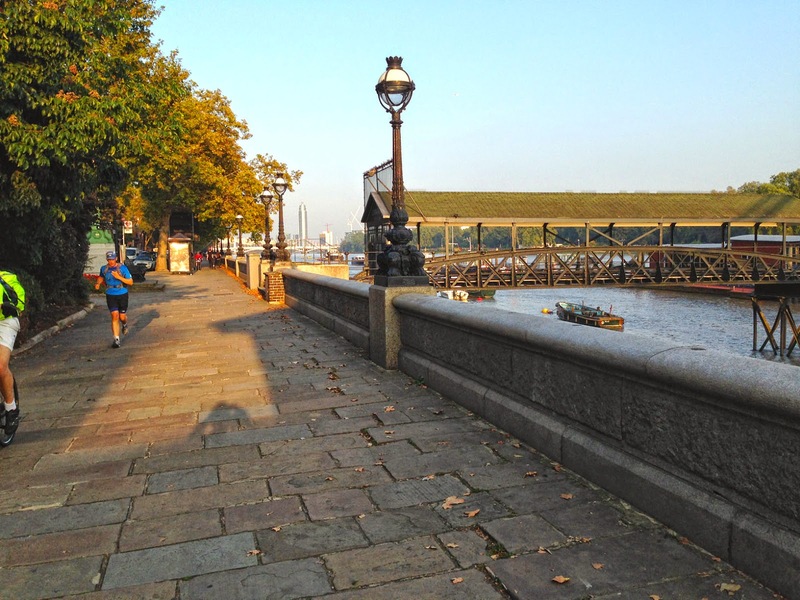 Now cross Chelsea Embankment and turn right to run westwards along the Thames for a few blocks. Across the river is Battersea Park, itself a great spot to run. You're running towards the beautiful Victorian suspension bridge, Albert Bridge. Run under the bridge and continue along the river for a few more blocks. 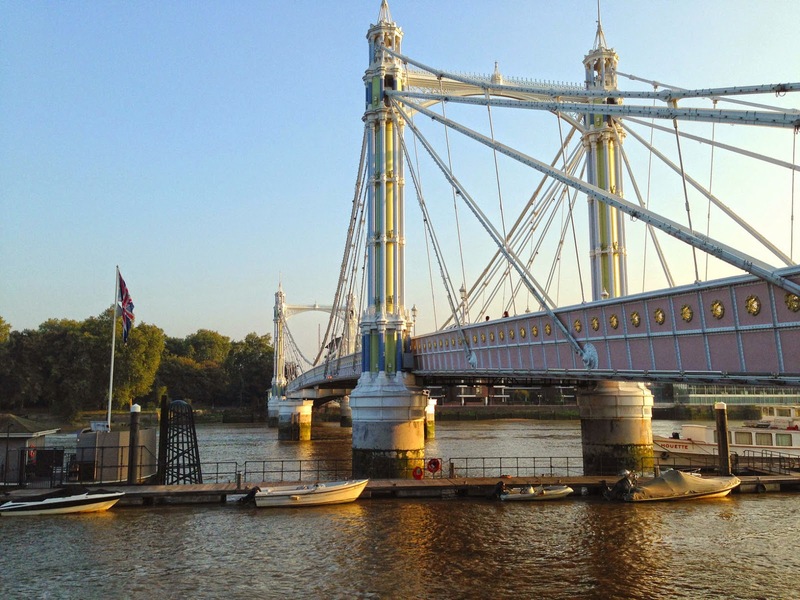 ANOTHER NOTE: If you want a bit more immersion in the Thames atmosphere, you could cross Albert Bridge and continue running west along the other side, past all the modern buildings over there, then cross back at the next opportunity, at Battersea Bridge. About a block before you reach Battersea Bridge, you'll see a church along the Embankment to the right, Chelsea Old Church. Cross the street there, and now run back eastwards through the narrow strip of park along Cheyne Walk, on the other side of the Embankment. There's a statue to martyred Sir Thomas More at the church. At the statue of Scottish philosopher Thomas Carlyle, relaxing in a nice chair, turn left to run north along Cheyne Row. 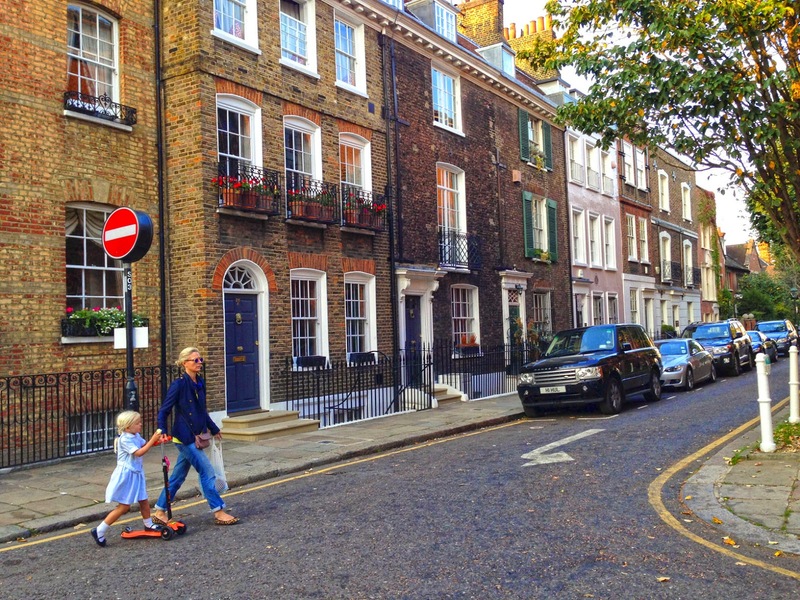 This is another great Chelsea neighborhood: the old heart of town, with a mix of classical housing styles. Chenye turns into Glebe Place, but continue as it turns right, then left before bringing you back to Kings Road. At the left-turn, you'll find the Chelsea Open Air Nursery in what looks like the oldest house in Chelsea: very charming. Now, at Kings Road, just turn right and run straight back to Sloane Square, trying not to plow into too many shoppers or zombies texting into their phones as they hurry along. 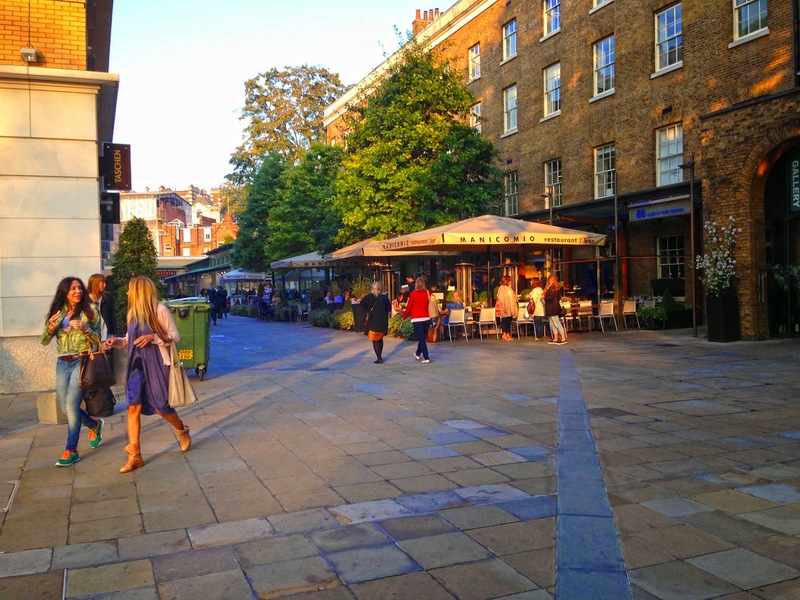 Maybe explore up and down a few side streets along the way, or through the quiet stretch of shops at the Saatchi Galleries on the right side, just after the Duke of York Square. So nice here in Chelsea!